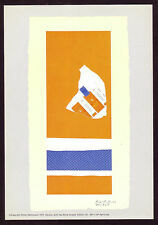 [Handprinted miniature of lithograph by Robert Motherwell.]. Motherwell, Robert (1915-1991). Printed in 1972 on high quality archival paper. P encil numbered from a limited edition of 500. LYONEL FEININGER. THE MODERN MASTERS COLLECTION. 'THE WHITE MAN,1907'. PRINTED BY: DACS. 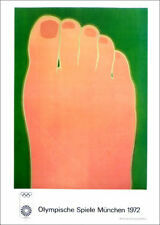 Tom Wesselmann Munich 1972 Olympics Poster Print 16" x 11"
Major public works by Chillida are in Barcelona, Berlin, Paris, Frankfurt and Dallas. A large body of his work can be seen in San Sebastián, including Haizeen orrazia (The comb of the wind) installed in the (often stormy) sea in La Concha bay at San Sebastián. Hans Georg Rauch(German,1939-1993): Untitled. Printed signature, not hand signed. This print was published in 1976 by H.M.K. Fine Arts of New York City. The prints had perforations at the top and were designed to be removed for framing. British painter and printmaker Richard Smith's fusion of abstract principles and contemporary subject matter is utterly unique. Born in 1931, Richard Smith spent most of his adult life working in New York, dying on the south shore of Long Island in spring of 2016. Having exhibited her work for over six decades (early 1950s until 2011), she spanned several generations of abstract painters while continuing to produce vital and ever-changing new work. Her work has been the subject of several retrospective exhibitions, including a 1989 retrospective at the Museum of Modern Art in New York City, and been exhibited worldwide since the 1950s. YVES KLEIN. 'BLUE SPONGE RELIEF'. RARE AUTHENTIC 1980's ART PRINT. Richard Lindner Marilyn Was Here Offset Litho Print Art 12-3/4" x 11-1/4"
Richard Lindner. "Marilyn Was Here,1978". 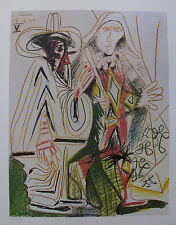 Offset lithograph reproduction of the artist's painting, on thick paper, excellent condition. Size: 24-1/2" x 16-1/4" (62.2 x 41.3 cm) image size. 32" x 24" paper size. Horst Antes(German,1936-). Printed signature, not hand signed. This print was published in 1976 by H.M.K. Fine Arts of New York City. High quality printing. Size: 23-1/4" x 16" (59 x 40.6 cm) paper size. The use of various shades of orange and blue allow for the appearance of perspective with a clean black background. THE CONNOISSEUR " or ". ABSTRACT AND CONCRETE ". The colors are beautiful. Print size: 11" x 15" (or 8" x 10" on request). It is NOT on the actual print! Manufactured in Switzerland. Signed in the plate. Greyed Olive Green, Red on Maroon, 1961. Mark Rothko (1903 - 1970 ). Mark Rothko: Seven Paintings from the 1960's. ©®™ 1983 Mark Rothko Foundation. Walker Art Center. YVES KLEIN. RARE AUTHENTIC 1994 ART PRINT. Size: 35,2 x 27. PRINTED BY: KUNST BONN. Léonard JANKLOW. Friends For Life ". There always might be slight color variation from the Original to the colors you see on the photo's. HAND SIGNED. Joan Miro(Spanish,1893-1983 ): Obra de Joan Miro. Not signed or numbered. Size: 18-1/2" x 24" (47 x 61 cm) paper size. 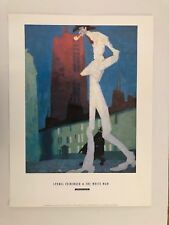 John Graham Emmerich Gallery New York Poster Print 15" x 11"
Printed in France by Mourlot. Joan Miró i Ferrà (Catalan; 20 April 1893 – 25 December 1983) was a Catalan Spanish painter, sculptor, and ceramicist born in Barcelona. A museum dedicated to his work, the Fundació Joan Miró, was established in his native city in 1975. Maurice Esteve(French,1904-2001). Two page s from "XXe Siecle Panorama", 1972, an art review folio book published in Paris and printed in Italy. Size: 12-1/4" x 9-1/4" (31 x 23.5 cm) paper size. Condition: Excellent. All 14 prints depict landscapes of Greece. Size of the calendar is 45 cm (17.7 in.). X 34 cm (13.4 in.). GREEK ARTIST NIKOS EGGONOPOULOS! Special painting. ORIGINAL WATERCOLOR! NO RESERVE! 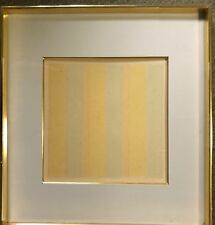 Saul Steinberg Crayon Et Paysage Poster Print 16" x 11"
Not signed or numbered. Size:16" x 11"(40.6x 28 cm)paper size. Roy Lichtenstein Pointing Finger Poster Print Art 16" x 11"
Not signed or numbered. Size:16" x 11"(41 x 29.2 cm ) paper size. Alberto Magnelli(Italian,1888-1971). Condition: Excellent. Three page s from "XXe Siecle Panorama", 1972, an art review folio book published in Paris and printed in Italy. Size: 12-1/4" x 9-1/4" (31 x 23.5 cm) paper size. Joan MIRO Spanish Galerie Maeght Repro Poster 16" x 11"